This one can be somewhat funny. Pakistan apparently has come with some new plans to destabilize India by influencing some developments in the north, west and southern parts of the country, as part of its multi-pronged strategy. Terrorists who were caught by Indian Security Force in Kashmir revealed this information. ISI (Pakistan’s intelligence agency) is the main culprit behind it claims a magazine Power Politics. 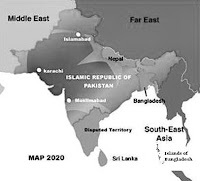 The map targets North India, and shows the region as ‘IslamicRepublic of Pakistan’ by 2020. It also projects South India as disputed territory and treats Indian neighbours China, Nepal, Bhutan, Bangladesh, Myanmar, and Sri Lanka as their neighbouring countries. They also considered Andaman and Nicobar Islands of India as Islands of Bangladesh. The map also indicates their desire of changing Mumbai’s topography, turning South Asia’s economic capital Mumbai (Bombay) into ‘Muslimabad’ by 2012. An article in the Power Politics magazine says that the ISI has passed two maps to the Pakistan Army to increase the moral of the troops by giving them a target to break and merge India in Pakistan forming Islamic Republic of Pakistan by 2020. This will somehow increase the confidence of the public of Pakistan as well, who always dream of troubled India. The terrorists are using alternative routes to India. From Pakistan they go to Dubai, Bangkok, Nepal and Bangladesh to enter India. 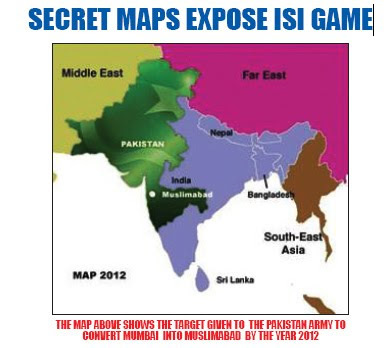 The write up further says that ISI has been attempting to cover India both from sea and land routes just like the Chinese strings of pearl theory. ISI is already pushing fake Indian currency in to the Indian market thus creating a hole in the Indian economy. Pakistan is, time to time, searching for chances and making excuses in front of the world to bring its force back to the Indian borders, as they are currently under the pressure from U.S, fighting with insurgency near Afghanistan-Pakistan border. The magazine doesn’t support with any other proofs and such big claims have never been investigated or shown in mainstream media. So far the maps looks made up and doesn’t look authentic.